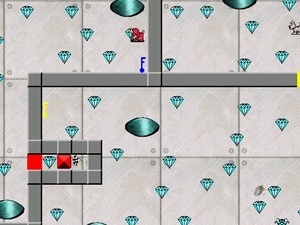 Jewel Hunter is a standard maze game where you must collect all the diamonds in the level in order to pass it. Jewel Hunter features ten levels which all include something new in each with the exception of the final level where it is four times the normal size and includes everything you have encountered so far. This level claims to be shaking due to earthquakes created by the upcoming boss in the next level, but in reality this was due to a glitch I couldn't fix at the time and I simply made up a false explanation. An interesting feature in the game is you have the ability to choose between playing as a human, or as Pac-Man.